Instead of food designed to heal an infection with antibiotics, Probiotic Plus is intended to strengthen Koi immune systems and help prevent bacterial infections from ever taking hold. Starting with Blue Ridge Growth Formula, it's then enhanced with three additives – Primalac, vitamin C and montmorillonite clay. 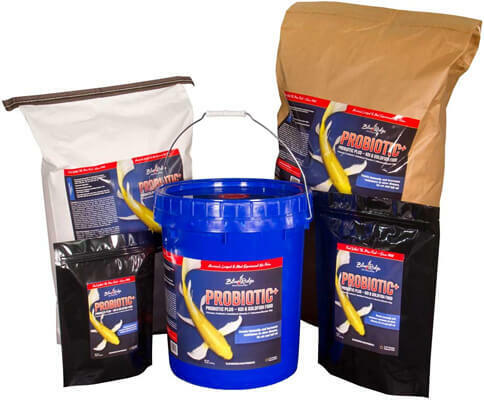 Feeding Probiotic Plus is most important during the most stressful times of the year for fish, particularly early spring when the water is warming, harmful bacteria are active, but the fish’s immune systems have not come out of dormancy and strengthened sufficiently to fight off bacterial infections. Primalac Probiotic: Helps maintain an optimal microbial balance of good bacteria over pathogenic bacteria, increasing health and immunity. Vitamin C: Strengthens immunity and increases overall health in carp populations. 60202 - Blue Ridge Floating Probiotic Plus Koi & Goldfish Food 2 Lb.